At the beginning of “The Breakfast Club” John Bender portrays a stereotypical character, “ The Criminal”. His character is one of the most important, being the main protagonist and he demonstrates the theme of accepting oneself and others. 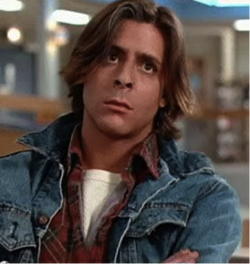 At the beginning of the film john bender can be seen as the tough guy, bullying and teasing everyone. As the viewer, we can see that he is emotionally wrecked as he acts in a violent approach in situations he does not like. He shows no respect to the people around him and makes himself not welled liked by anyone. As the others represent 4 stereotypical characters the viewer can see that not even the jocks, princesses, nerds and weirdos liked the way he acted. His style of clothing also represents a criminal; the viewer can even comprehend this without him doing anything, which creates realism throughout the film. John hides his sympathy for Claire through making fun and annoying her in most of the movie. This relationship between these 2 most important characters represent that anyone can make you happy if you give them a chance. At the beginning of the film john treats Claire really bad and annoys her, although deep down John Bender was just trying to hide his sympathy for her. As all five of the students came into the Saturday detention together not knowing anything about each other, they are forced to get to know each other. Before detention everyone didn't understand why john bender acted in such a violent approach, resulting to all students spreading rumours and presuming that he was naturally like this. Throughout the film the 5 students manage to bond and get to know one another, as john bender tells his story and why he acts in such a violent matter the other students start to understand why he does so. The way his parents don't care about him and always beat him destroyed his life physically and emotionally. As the students listen they don't believe him and when Andrew goes to confront him john pulls out his arm for evidence. On his arm was a cigar mark his father engraved on him for spilling paint on the garage floor. The other students feel sorry and apologise while bender goes off in rage because his father doesn’t love him. As the students start to get to know each other they start to understand each other’s problems and how their background affects their personality. John bender starts to tolerate and approve his classmates, as he also understands their situations. John bender shows kindness and his approach to others start to change because he also feels sympathy for the others.